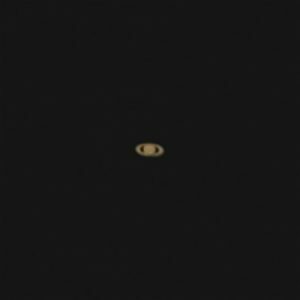 The first obvious target was Saturn, as it was situated low in the sky, and heading lower, soon to be obscured by trees. We were looking at the planet through the worst possible conditions, as the cooling Earth created much turbulence in the air, and the low aspect meant we were looking through a lot of haze. But even so, it’s always a thrill to see the ringed planet. Its rings are currently quite open, and even in the worst conditions, it’s always a worthwhile telescope subject. With my Canon 750 DSLR on a T-ring, I shot about 40 seconds of film of Saturn through my 8” Skywatcher, which I stacked in Registax and although by current astrophotography standards it’s a poor planetary photograph, it’s a good representation of what we were able to see through our scopes this evening. Mars dominated the South-west horizon. A few months after its closest approach, it’s still a superb, shining, salmon-pink beacon in the sky. Through our scopes we could clearly see the 90% phase, (which sparked much debate on planetary phases), and later on in the evening, as the air steadied, definite V-shaped markings were seen on the disc. But our planetary observations were not over. On my ‘hit list’ in my observation book I’d written down Uranus, currently in Aires. But I was dismayed to see the constellation of Aries was lost in the Wolverhampton sky-glow six or seven miles away. Hardly any stars were visible through my finder-scope, so finding the icy world through my 8” mirror was going to be a task for another time. Luckily, Steve’s go-to scope saved the day, as it was able to navigate through the light pollution and offer up a fine view of the remote planet. It’s disc could be clearly seen, especially through the 4mm eyepiece, and we were thrilled to be able to add this elusive planet to our list of observed objects this evening. Whilst some might find the small blueish ‘dot’ underwhelming, it’s worth bearing in mind we’re looking far, far out into the coldest reaches of our solar system. This planet wasn’t discovered till a hundred years after Galileo saw Jupiter’s moons. With the bright star Vega, and the constellation Lyra, right overhead, it seemed fitting to start our tour of Deep Sky Objects with the Ring Nebula, number 57 on Messier’s famous list. 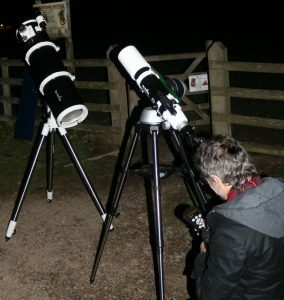 Luckily one member bought a set of very high quality eyepieces, and through a 6.7mm eyepiece and the 8” mirror the nebula appeared surprisingly bright and large, its nebulous structure easily seen. Steve showed me NGC 457 (also known as the Owl Cluster, the ET Cluster, or Caldwell 13), which is an open star cluster in the constellation of Cassiopeia. This striking telescopic object can be imagined as a flying bird, or even Speilberg’s ET, with outstretched arms and bright, shining eyes. M29 is an open cluster, prettily placed in a star field in Cygnus. We had a lovely view of it through the Skywatcher ED80. This telescope really has some fine optics. Martyn, as usual, was seeking out double stars with his reflector. Both Almach (in Andromeda) and Albereo (in Cygnus) looked stunning tonight. The colour contrast easily visible. Both these double stars are similar, a bright golden star with a fainter blue companion. Many times during the night we visited M31, and the best view came around 10.30pm through the ED80, when its companion galaxy M32 could be easily spotted, and the main galaxy itself was showing hints of structure. I can’t wait to get the society’s newly acquired 16” reflector on M31. Hopefully it won’t be too long. I’d been doing a lot of binocular observations over the summer, and M71 in Sagitta has eluded me every time. It should be very easy to find, the constellation is quite distinct and the object well placed almost between two stars, and Sagitta is right overhead. This evening, however, I was in luck, and we saw M71 in the 8” mirror. At first, we thought we were looking at faint nebulosity. Not so! After ten minutes, (and perhaps due to the dew on the eyepiece clearing), we were able to see it was in fact a quite dense star cluster. This was my favourite find of the evening, as I’d never seen it before, and I can understand now why there’s some contention about it being either a loose globular cluster, or a dense open cluster. I hope to visit it again under darker skies, it really is quite easy to find, as long as you have a clear enough sky and a capable telescope. We looked at The Coathanger asterism in Vulpecula next, first through the finder-scope and the 10×50 binoculars, then the 8” mirror. This asterism is also known as Brocchis Cluster, or Collinder 399. 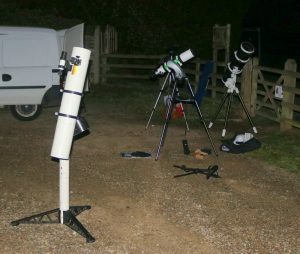 Other fine binocular targets tonight were the Pleiades and the Hyades, the well-known naked-eye open clusters that herald the oncoming winter, the latter rising around 9.30. Other deep sky objects visited tonight were the Double Cluster in Perseus, (NGC 869 and NGC 884), which looked very pretty, and two of the brightest galaxies in Ursa Major – M81 and M82, (Bode’s Galaxy and its telescopic companion). These were quite faint tonight, but still we could see the shape of the galaxies. Bode’s being the brighter, face-on galaxy, and its fainter companion clearly cigar-shaped and edge on. Bode’s is 8.5 million light years away, (In comparison, the Andromeda galaxy is 2.2 million light years, our closest major galaxy). We also enjoyed a fine view of the Alpha Persei Cluster, a very beautiful field of stars surrounding the giant star Merphak. This cluster is also known as Mellotte 20, or Collinder 39. we looked at this through Martyn’s 110mm reflector, but it’s also a very nice binocular object, and at only around 600 light years away, a far closer object than the distant galaxies we had previously been looking at! The Go-To mount searched for Neptune. Was it one of the stars we saw in the field of view after the scope settled? Very possibly. It was hard to say, and without a star map to corroborate the view, we can only honestly say “we possibly saw Neptune”. I’ve always found the best way to find Neptune is under a very dark sky with 10×50 and a screen-grab from Stellarium, the free star-chart program. And even then, it’s a rather faint point of light. If Neptune is visible the next time we have a session, I’ll take a screen-grab beforehand. I tried to find M103, a cluster in Cassiopeia, without luck, although I’d seen it through my binoculars earlier that week! When reading up about this cluster later, I found it can be quite underwhelming telescopically, so perhaps I’d seen it, and passed it over? Auriga was rising after 10pm, but still too low to see the chain of star clusters. I did see the ‘Leaping Minnow’ asterism though, that can be used as a marker for the three M-numbered clusters in Auriga. With Hercules riding high, M13 and M92 were easily viewable though. M13 being particularly bright tonight, with stars resolved around the edge. As the evening wore on, the slight haze in the sky turned to mist, and we found our eyepieces dewing up, so after a coffee, courtesy of the village hall kitchen, we packed up our scopes and agreed it had been another productive observation session once again.